When my elder daughter, Chace, first mentioned the idea of attending a liberal arts college, specifically Kenyon, I wasn’t convinced it was a good idea. I initially considered liberal arts to be a rather narrow concept. It brought to mind an education that was, I assumed, skewed left of center politically, focusing on literature, languages, and well — art! I could certainly understand the appeal of those evocative words “liberal” and “arts.” For a teenager like Chace, who was liberal herself, artistically inclined, with a love of Irish fiction and poetry, four years living on an idyllic rural campus surrounded by like-minded students would presumably be tantamount to Utopia. But it wasn’t the kind of academic foundation I envisaged for either of my daughters. As a British ex-pat, I had a misconception about colleges like Kenyon. 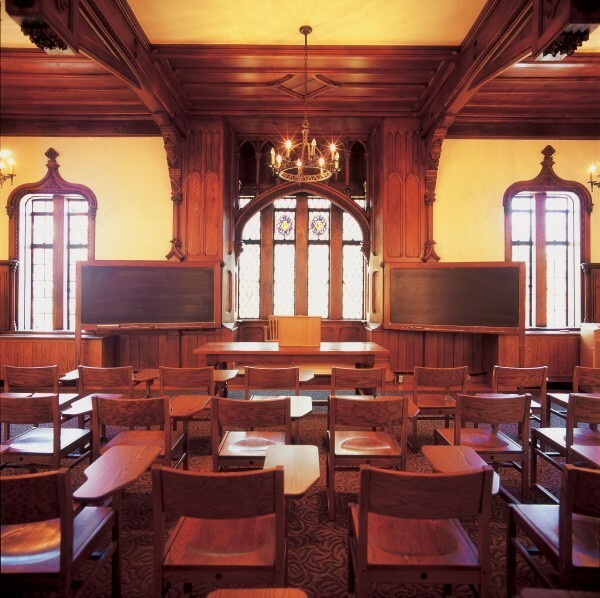 The U.S.-style liberal arts college simply didn’t exist in England, where applying to college invariably meant deciding at age 18 on a subject that would be the singular focus of a degree awarded at the culmination of three years’ intensive and concentrated study — whether it was engineering, English or — in my case — history. The degree didn’t have to be vocational, but it demanded total immersion in a chosen major. Even after years living in the States, I didn’t fully appreciate that a liberal arts education at a leading, competitive college like Kenyon would offer a rigorous academic curriculum. So how did both my daughters end up as Kenyon students? Thankfully, Chace ’16 and Ava Rose ’21 are strong-minded individuals who took it upon themselves to research the kind of colleges that suited them. And during Chace’s senior year at high school, I had a change of heart. We visited Gambier one icy week in February and Kenyon had us at hello (I am sure it has that effect on many families)! Chace knew right away that she had found her dream school, and my misgivings evaporated as we toured the stunning campus and spent a long lunch chatting with the friendly admissions staff. I soon realized that Kenyon would provide a rich education and environment for Chace. As it turned out, in some ways, Chace did epitomize my original notion of a liberal arts student. She majored in English and studied French. But over those four fulfilling years she spent at Kenyon, I came to understand the real value of an education that offered so much more than intensive research into one discipline. Along with the chance to delve deeply into their chosen majors, students at Kenyon learn to think critically and become truly independent. I also realized that the term “Liberal Arts” itself is a misnomer. At Kenyon, there are opportunities to study subjects across a broad spectrum — from Shakespeare to the sciences. And politically, Kenyon isn’t exclusively liberal. During her first semester at Kenyon, in the fall of 2012, Chace told me about an eye-opening experience when her friend Gracie encouraged her to go out and about in Mount Vernon, canvassing for Barack Obama — even though they weren’t always greeted warmly by local residents. Other Kenyon students were canvassing for Mitt Romney. At Kenyon, I learned, there were, and still are, vigorous debates among students across the political aisle. Chace’s experience on the Hill was anything but narrow. In addition to students from coastal states, Chace got to know people from all over the country: Tennessee, Michigan and of course Ohio, as well as from far-flung corners of the world. Because of Kenyon’s size, she told me, people learn from one another. And while it might appear that a rural campus has the potential for isolation and insulation, in fact, the opposite seems to be true. Kenyon is populated by students with entirely different views on culture, spirituality, politics and academics. What’s also interesting is that the myth of teachers and students hanging out together is a reality at Kenyon. Chace often had coffee with her professors and has maintained friendships with them. By the time my younger daughter was contemplating college, Kenyon wasn’t at the top of her list. Inevitably, Ava-Rose wanted to carve out her own distinct path. But after touring several large universities and liberal arts colleges, she set off for a weekend to visit her sister in Gambier. I don’t exactly know what happened during those three days, but Ava-Rose arrived home with her heart set on Kenyon and is now a first-year student. Our 19-year-old has very different academic interests from her sister, intending to major in environmental studies. Taking classes from “Anthropology of Food” to an English course called “Making a Life” — which examines how literature contributes to understanding human existence in a deeper way — she is having her own Kenyon experience. I find it extraordinary and impressive that students who are on a broadly scientific track, like Ava-Rose, don’t need to bid farewell to the arts; they are in fact encouraged to move between disciplines. Outside the classroom, Ava-Rose has been able to pursue other interests, volunteering at the Kenyon Farm, making bread and knitting. During the first couple of months she attended talks by authors including acclaimed Irish novelist Colm Tóibín and the cutting-edge Chicago poet/rapper Nate Marshall. Perhaps the most exciting cultural event of the semester for Ava-Rose was an invigorating lecture by Robin Wall Kimmerer, a distinguished botanist and author. It strikes me that the eclectic mix of speakers and the intimacy of the settings at Kenyon are unique, highlighting the vibrancy of the College. As I sit mulling over this blog with my daughters during winter break, discussing the intrinsic value of the liberal arts, Chace suggests looking up both words in the dictionary. “Liberal” is defined as: being “willing to respect or accept behavior or opinions different from one’s own, being open to new ideas.” The “arts” are defined as: “works produced by human creative skill and imagination.” As an enthusiastic Kenyon parent and liberal arts convert, from my perspective those words aptly encapsulate the essence of what Kenyon has to offer: an education that expands horizons, encourages imaginative expression, inspires creativity and allows students to dream, learn and grow — becoming informed and active members of the community. I can’t imagine anything more exciting or worthwhile.